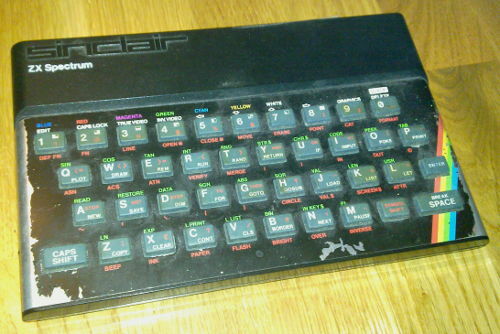 My Sinclair ZX Spectrum became 30 years. Happy Birthday! We have had a lot of fun together for the last 30 years. I hope we can have fun for another 30 years. I have spent many hours writing programs and composing music using my Speccy, but even more hours have been spent on fun and very playable games. A favorite is, Jet Set Willy. In this game you collect things (cleaning his house) before you get to go to bed. There are many difficult rooms to visit before you succeed. You can only go left or right and you can jump. It may sound simple, but it is very playable and fun. Some of my other favorite games are listed here.